This blog post details the changes made to the software for Version 3, and how to download it – the information is all relevant for Version 3.0.2 which is now available. The upgrade is free for existing customers – see below for instructions on how to use your current activation key as a coupon code. Update 27th April – please see the end of this post for some trouble-shooting tips before you upgrade. An option to generate a Stitch glossary has been added to the Export to Text dialog. 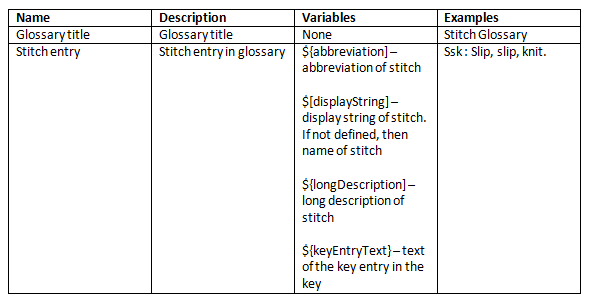 This allows you to output a full glossary of all the stitches included in a chart along with their full explanation, in addition to the symbol key which only gives you the abbreviation. German and Danish Stitch libraries have been added for both Stitchmastery dot and dash symbol sets – you will find these under the Stitch Libraries tab in the Preferences dialog, and under the Stitch Library and Text Templates tab of the Edit Diagram Properties dialog. Text templates in both German and Danish have been added – for information about how to use and edit text templates, see the Text Templates section under Tasks in the Help menu. The default for Stitch Template Condensed Single has now been changed so that it outputs k1 and p1 instead of just k and p. For information about how to use and edit text templates, see the Text Templates section under Tasks in the Help menu. A new output format type, EPS, has been added. This is a vector format similar to SVG and PDF. It is particularly useful for those users publishing patterns using InDesign as EPS images can be imported directly into InDesign. Also, there is a new option available for vector formats, ‘Convert to text to shapes’. Currently this is the default behaviour. From version 3, for vector formats only, this can be turned off, so that the text in the chart such as row and column numbers, text in the key and the chart title are output as text rather than shape outlines. This means that they can be edited as text by other programs. If you are not sure about which format to use, you may find the later section of our FAQs blog post here helpful. Consistency of stitch width: We have had some feedback that Stitchmastery is inconsistent in the width of symbols used for stitches. For example, the Estonian gathered stitches are only 1 column wide despite the fact that they consist of multiple stitches. We’ve been told that we should have the convention of making a stitch the same width as the number of stitches on the needles after a stitch has been worked. For example, a ‘3 into 7 gathered stitch’ should take up 7 columns in a chart. Likewise a ‘6 into 2 gathered stitch’ should take up 2 columns. The rationale behind this is that it would reduce the number of no-stitch squares required in a chart and that a consistent approach would be easier to chart and easier for knitters to understand. Other stitches that do not meet this convention are all of the knit and purl increases except for the m1 variants. The most popular response was that we should change to meet the convention. However, to give you the option to continue using the previous approach if you prefer, existing stitches have been kept but have been moved to a palette drawer called ‘V2 old stitches’ that is to be found at the bottom of the stitch palette. The names and abbreviations of these stitches have had ‘old’ appended to them to distinguish them from their newer v3 versions. The v3 versions all have the width that corresponds to the number of stitches produced by the stitch. Please be aware that if you change the stitch library used in the file, this will change to a v3 library and your stitches and written output will change to the new versions, and there won’t be a one-click option to go back – you would need to reselect all the old stitches. So if you are unsure whether you want to move to the new convention, we would recommend saving a copy of your knt2 file with a new name before changing the library, so that you have an original copy safely stowed away just in case. To the ‘Yarnover Increases’ Drawer we’ve added wider versions of stitches. To the ‘Estonian Increases’ Drawer we’ve added wider versions of stitches. When a Chart Diagram file is saved, if the Preference option ‘Automatically create a backup file (*.bak) when saving’ is checked then Stitchmastery copies the current file (example.knt2) and adds a .bak file extension so there is a copy called example.knt2.bak. Stitchmastery also saves the changes to the current file. Thus example.knt2.bak would have a version of the chart file at the point that it was last successfully saved. The reason for implementing this is that, if something happens to Stitchmastery at the point when it is saving any edits to the file on disk – for example, a power failure – then currently this could corrupt the file and all of the data in the file would be lost. This is a very rare occurrence but, if it does happen, all the data in the file is lost. This new feature safeguards against that – if something happens whilst the save is in progress, the current file would still be corrupted and the most recent edits lost but at least there would be a previous version available that could be recovered. – “when a chart contains a repeat and new rows are inserted into the chart, the repeat is missing from at least one of the rows” – this bug is now fixed. – “when a repeat contains stitches that are all of the same ‘type’ – for example all knit stitches – and the repeat should be worked several times, the extra number of repeats was ignored” – this bug is now fixed. How do I get Version 3? Go to the downloads page and find the correct download link for your machine. The full software will download and you’ll see some features need to be unlocked by purchasing an activation key, which you can do from our Products page. Before downloading and installing version 3 you will need to upgrade your existing Version 1 / Version 2 activation key to a Stitchmastery 3.0 Activation Key. Your existing Version 1 / Version 2 activation key will NOT work with Version 3 of Stitchmastery. You will need your existing activation key, from whenever you purchased Stitchmastery. You should attempt to locate this before taking any action, because if you cannot find it, you will need to contact us to receive a copy of the key (by emailing support[at]stitchmastery.com). When you have your activation key, visit the Products page on our website, select Stitchmastery 3.0 Activation Key, and input your existing (V1/V2) activation key in the coupon box. This will set the price to zero and allow you to “buy” a 3.0 activation key which will work with the new version. 1) Make sure that you have entered all of the characters exactly as written including hyphens but with no spaces. You can enter letters as either upper or lower case – either will be accepted. 2) If the coupon is still not found please contact us at support[at]stitchmastery.com with details of your previous purchase. Please include as much information as you can to enable us to quickly sort out the issue – eg the email address you used when purchasing, the name it was purchased under (might that use your maiden name? business name? your partner’s name? ), even better any details of the Paypal transaction or date of purchase if you have those details. If we can’t find the purchase under your current email address or name we’ll have to come back to you with these questions so it will save time all round if you send the details to begin with. Each coupon can be used only once. Your new Stitchmastery 3.0 Activation Key can be used on up to two machines at any one time. If you replace or upgrade a machine and need a further activation please contact us on support[at]stitchmastery.com. When you checkout your new Stitchmastery 3.0 Activation Key you will be prompted to set up an account on the Stitchmastery site with a password of your own choice and access with your email address. This account will allow you to check your new Stitchmastery 3.0 Activation Key for yourself, as well as viewing your purchase history. If you want to work on charts made using Version 2 in Version 3 we would recommend watching this video before opening any V2 files in V3, just to be sure you know what to expect. In short, they will work if you continue using the same library, but when you change to a V3 library you can’t change back to a V2 library in that file. If you have any doubts, we would recommend you use “Save As” (in either version of Stitchmastery) to create a copy of your file before you change anything. You can find the new User Manual on our Support page, and please feel free to ask questions in our Ravelry group or by email to support[at]stitchmastery.com. We strongly advise you back up your files before making any changes to your machine. When you uninstall Version 2 (aka Knitting Chart Editor), or if you install Stitchmastery to the same folder, the existing files will be removed. If you have followed Stitchmastery’s default locations for saving (ie the folder for the software appears in your Documents folder – for specific reasons – and your chart files and libraries are stored under your user ID on the C drive) then this is not a problem but if your chart files and libraries are saved in the same folder with the application, icon, installer, configuration files, they will be deleted. You should save them in a separate folder. If you want to keep Version 2 on your computer you should change the location for saving Version 3 when you begin the download. Creating a new folder with the name “Stitchmastery Software” may help you ensure you save your chart files and libraries elsewhere. Known Issues which we are working on – updated 22nd June. We have released Version 3.0.2 which fixes a number of problems present in Version 3 – see our blog post for more details.